At 79 minutes this episode is nearly feature length and is the first to really truly live up to the tag line “a song of ice and fire”. Jon and Daenerys are a song of ice and fire. Jon’s parents were a song of ice and fire. Night King versus Dragon Queen is a song of ice and fire. Arya versus Sansa is a song of ice and fire. Jorah is born of ice and pledged to fire. Tormund is kissed by fire and pledged to ice. So much ice! So much fire! So much ice and fire! The pacing is a bit strange. Part of it is that zombies, and snow, are slow while dragons, and fire, are fast. But the long scenes feel, well, long, and then there are a whole collection of little mini scenes, where, in a continuation of last week, everybody catches up with everybody about everything that has happened in the last six and some seasons. Plus at least five Momentous Moments happen and it all seems rushed and drawn out at the exact same time. There are only three locations this week, skipping King’s Landing entirely (but everybody heads there for the Royal Rumble next week so). In Winterfell, things are a mess as per usual. If Arya had returned to find King Jon, I think she’d be okay. Still traumatized, still an assassin, still in need of some serious therapy/deprogramming, BUT, also okay. At least okay-er. Instead she returned to Queen Sansa and Queen Sansa is one of Arya’s nightmares. From Arya’s perspective the sister she can’t live up to, the sister she never got along with, the sister who betrayed her, has gotten everything she wanted. Sansa and Arya have two, long, scenes, and in both Arya is creepy as all get and Sansa is creeped the creep out, and basically terrified. First, they meet on the Stark Brooding Ledge and Arya tells a story about the time her father made her feel good about herself that ends with “and then you betrayed and murdered him”. 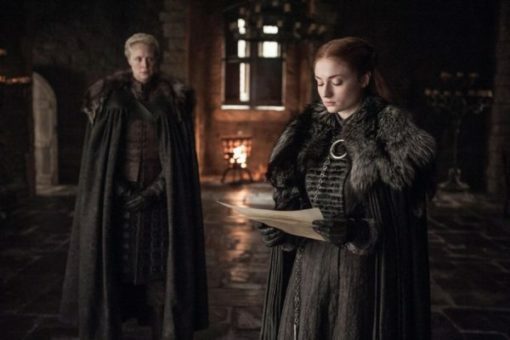 Sansa is, reasonably, confused and upset, so Arya pulls out the letter she found in Littlefinger’s bed (number one reason to be wary, but Arya is leaning all the way into his plot). It’s the letter Sansa sent to Robb, under Cersei’s direction, begging him to end the war so she could marry her beloved Joffrey. They proceed to fight about whose life has been the worst since that point. We all know the answer is BOTH, but these two have never been any good at communicating with each other. 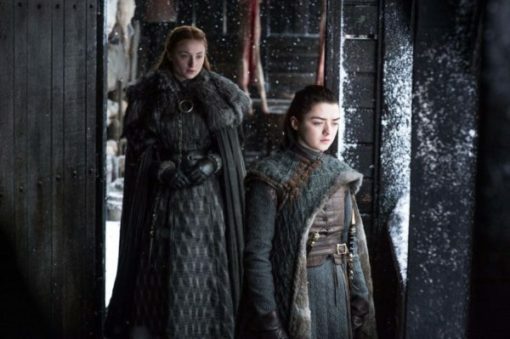 In the second sisters at war scene, Sansa tries to find the letter in Arya’s room, presumably so she can burn it, but finds Arya’s bag of skinned faces instead. Sansa is, reasonably, confused and upset. Arya catches her staring at them in horror and pounces on the opportunity to convince her sister she’s completely lost her mind and will murder her and steal her face at any moment. Look, I love Arya, but she needs to dial it back by about 10,000. Sansa is COMPLETELY CORRECT to be afraid when the little sister who openly disliked her for their entire childhood has a collection of skinned faces under her bed and straight up tells her AT KNIFE POINT she could replace her and no one would even know. I realize now why the Faceless Men are supposed to stay in their guild. Sansa meets with Littlefinger, exactly as he wanted, and he suggests she use Brienne to intervene with Arya. I’m not sure what his plan is, but Sansa chooses to send Brienne to King’s Landing as her representative in the Royal Rumble instead. This is an A+ idea in many ways. 1) Whatever Cersei has planned for Sansa in King’s Landing is not good so avoiding it is the right call. 2) If there really is a Royal Rumble (of any kind) Brienne is the best champion Sansa could have. 3) As Sansa points out, Jaime Lannister is in King’s Landing and we all want that reunion. 4) It’s not what Littlefinger wants. Unless he told her to use Brienne in order to get her to send Brienne away, which is possible, but, the other three still stand and at the least it shows she’s not blindly following Baelish. Brienne doesn’t want to go, of course, mainly because she doesn’t trust Littlefinger as far as he could throw her (which is not at all) but Sansa is insistent to the point of being rude. I remain hopeful that Sansa has a plan but nothing good is going on in Winterfell. 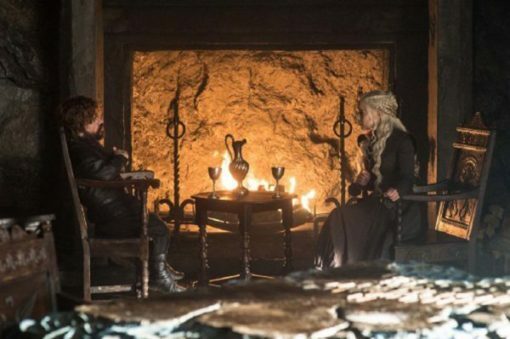 In Dragonstone, Daenerys and Tyrion have a fireside chat that starts as gossip about her men — Drogo, Jorah, Daario, “this Jon Snow” — but ends up being yet another fight about killing, ruling, and breaking the wheel. I would like them to stop using that metaphor, but I think it’s a lost cause. Tyrion cautions her not to lose her temper no matter what Cersei says or does to provoke her, but his main purpose this time, is to remind the audience that Daenerys can’t have children so she needs to adopt a different path to succession. She seems to think he wants to be named her successor, and maybe he does, but he has a point that our dragon queen is impulsive, brazen, and temperamental, and if she dies, well, Queen Cersei it is. 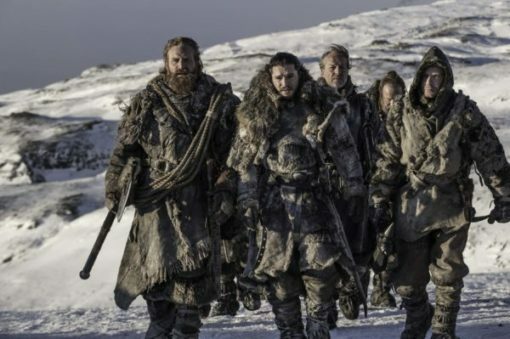 Meanwhile, beyond the wall, Jon Snow’s Suicide Squad — King Jon, Prince Gendry, Tormund, the Hound, Beric Dondarrion, Thoros, Jorah and a couple random wildling red shirts along to die before anyone important does — embark on their ludicrous plan to kidnap a zombie in order to prove to Cersei that zombies are real. On the way to Mount Doom, everybody breaks off into small groups to have fun little scenes that recap important plot points and/or share character building moments. Gendry reminds us all that the Brotherhood sold him to Melisandre so she could use his king’s blood to help Stannis win the war and the Brotherhood remind Gendry that he escaped that fate and tell him to stop whining. Tormund and Jon chat about the dragon queen. Jon says she’ll only help if he bends the knee and Tormund reminds him Mance Raydar refused to kneel and it was the wrong decision for his people. Jon tries to give Jorah Long Claw, the Valyrian steel sword Jeor Mormont gave him in Jorah’s place, but Jorah tells him to keep it and pass it on to his children. I kinda got the impression Jorah is resigned to Jonaerys happening and thinks this way a piece of his legacy will belong to a piece of his queen’s legacy. Which is sweet on all sides, honestly. Tormund propositions Jon, Gendry, and finally the Hound. But it’s all in jest, his heart is set on Brienne and he spins such a lovely image of their gloriously huge children that I became super scared he wasn’t going to make it. And of course, the Hound knows exactly who Brienne is because she beat him in combat. Their entire interaction is delightful. Jon and Dondarrion discuss the heavy weight of being brought back to life and what it all means. This discussion includes allusions to Jon’s parentage and his time with the Night’s Watch. Jorah tells Thoros how impressive he is with his flaming sword, that in some earlier battle with the Iron Born he witnessed he thought he was the bravest fighter he’d ever seen. I think this is backstory, not something that happened on screen but I really have no idea. But the point is pointing out how great Thoros is so we care when he dies (it didn’t really work on me, I was mostly relieved Thoros took the bullet for all the people I do care about). In fact all of these scenes include parts that feel like they’re foreshadowing their death. At the same time, they laid out reasons for them not to die, mainly a higher purpose (Jon, Dondarrion, Thoros, and Gendry have all already escaped death) but also a future (Tormund’s giant babies) or life unsettled (the Hound and Jorah are on paths of redemption, have they made it yet?). They fight in quick succession a zombie polar bear, and a small group of wights plus a walker who Jon kills, killing all but one of his zombies. How convenient! They capture the remaining zombie to bring Cersei (I will never get over this ridiculous terrible plan), and intend to head back to the Wall, but oops, the Night King arrives with his zombie hoards. The crew drag their prize onto an island in the middle of a frozen lake, and Jon sends Gendry running to Eastwatch to get a raven to Daenerys for help. Then they settle down to wait. Thoros succumbs to the cold and/or his wounds from the bear fight and/or the necessity of killing off a named character. They burn his body and consider their next steps. Jorah wants to focus on killing the walkers in order to kill the rest of the zombies the way Jon did earlier. Dondarrion wants to focus on killing the Night King because that would kill all the zombies. Jon wants to wait for Daenerys and stick to the plan. And the Hound wants to throw rocks at zombies….which clues them into the fact that the lake has refrozen and they can start the attack anew. Good job, Sandor. Luckily, Gendry makes it to the Wall and sends a raven for help. In defiance of Tyrion’s desperate pleas to leave the Suicide Squad to their doom — Dinklage acts his heart out here — Daenerys flies off to save Jon and Jorah and the rest. The zombies are no match for the dragons. Unfortunately, the Night King has the same kind of weapon Qyburn made Cersei and he’s better at wielding it than Bronn (he’s probably had practice). The ice spear hits a dragon and he falls to his death. Daenerys watches in shock and misery and Jorah watches Daenerys watching and I’m really happy he survives you guys. I love my old bear. Jon, being Jon, does not get on the dragon when he’s supposed to, choosing instead to protect them from the zombie hordes. Thus, when the Night King raises another spear to throw at Drogon, Daenerys, the remaining squad and their kidnapped zombie, they have to leave him behind (at his direction because Jon is Jon). I really wanted the third dragon, Rhaegal, to come back for him, or for the downed dragon, Viserion, to become a zombie dragon that was bonded to Jon, but instead Cold Hands/Uncle Benjen shows up and sends him to the Wall while he, being just as Stark Stubborn as Jon is, holds back the army of zombies. Jon escapes. And so, in their one remaining Greyjoy boat on the waters between the Wall and Dragonstone, Jon wakes to find Daenerys at his bedside. He tells her he’s sorry, they should never have taken on this ludicrous plan that cost her a dragon/child (accurate). She tells him she’s sorry she didn’t take him seriously, but now she’s all in. And then, because he’s Just So Jon All the Time, now that she’s given in and joined him at no cost to himself or his people, he agrees to swear fealty to her as ruler, and says all his constituents will, too, once they meet her. She’s delighted, he’s delirious, and they are falling in love — and for some reason it’s a problem. I mean, we know they’re related. And there is a war going on, and they are all likely to die at any moment. But that’s when you throw caution to the wind right? On the boat ride to probable doom? 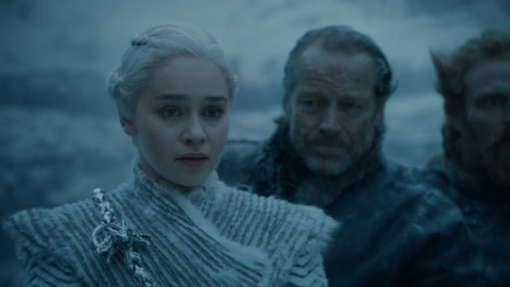 The most important part of this scene is when loopy medicated Jon calls her ‘Dany’ and she’s like, ew, only my evil brother who sold me to a war lord and I had killed with molten gold calls me that. This is important because loopy medicated Jon is adorable and because now I can never call her Dany again and I’m upset about it. And of course, now the Night King has an ice dragon. Winning: The Night King. Lord Baelish. Dead: Thoros. 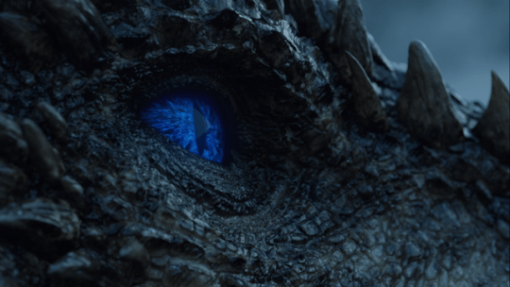 Viserion. Cold Hands/Benjen Stark (again).